The Old Almondburians' Society is a fellowship of past pupils and staff of King James's School in Almondbury, Huddersfield. 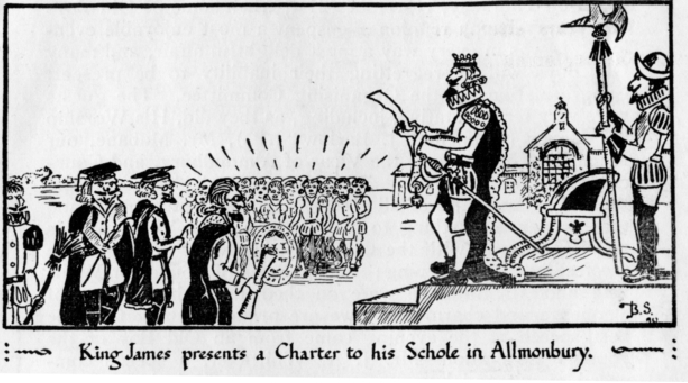 Throughout 2008, the School celebrated the 400th anniversary of its Royal Charter, granted in 1608 by James I of England. Membership is currently over 600 and the Society's affairs are administered by an Executive Committee which meets monthly at the Woolpack in Almondbury. l To uphold the honour and status of the School. l To provide a means of contact between members one with another and the School. Over the years, we have fulfilled the first objective in many different ways such as supporting the School against possible closure, building the cricket pavilion, floodlighting the school buildings, financing sound systems, providing sports kits for various teams and by using our membership network to place a massive range of skills at the School's disposal. We achieve our second objective by publishing our magazine The Almondburian to our membership three times a year and through this comprehensive website. There is also our main social event of the year the Annual Dinner, usually attended by 100-200 guests from all over the world, which gives people a chance to reminisce amongst their contemporaries. Membership ranges from those who joined the School in 1920 to those who left last summer. Membership of the Old Almondburians' Society is open to all former pupils and staff of King James's School and costs £10 per annum. The Society is the focal point for members wishing to contact former friends and colleagues. If you would like to join the Society by post, click here to download an application form. Alternatively, if you would prefer to join online, click here. Click here to view the Old Almondburians' Society Rules. This website is designed for viewing using Internet Explorer 6.0 or later, Mozilla Firefox or Google Chrome and a screen resolution of 1024 x 768 pixels.